Miami Dolphins have fined Don Jones after he made negative comments on Twitter about Michael Sam, the NFL's first openly gay player. 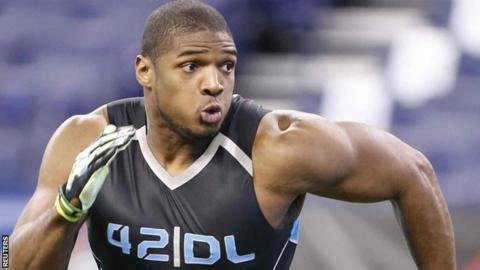 Sam, 24, was picked by St Louis Rams in the NFL draft and shortly afterwards Jones tweeted "horrible". The posts were taken down, and Jones was fined an undisclosed amount and been excused from team activities until he undergoes educational training. Safety Jones, 23, has since apologised for his comments. "I want to apologise to Michael Sam for the inappropriate comments I made on social media," Jones told the Miami Dolphins website. "I take full responsibility for them and I regret that these tweets took away from his draft moment. "Last year when I was drafted in the seventh round I remember the emotions and happiness I felt when I received the call that gave me an opportunity to play for an NFL team. I wish him all the best in his NFL career." Defensive lineman Sam, who revealed his sexuality in February, was chosen by the Rams on the final day of the annual allocation of new talent. "We were disappointed to read Don's tweets during the NFL Draft," said head coach Joe Philbin. "They were inappropriate and unacceptable, and we regret the negative impact these comments had on such an important weekend for the NFL. "We have met with Don about respect, discrimination and judgment. These comments are not consistent with the values and standards of our program."